Taste of Game and the Food Teachers Centre bring Home Economics, Catering and Food and Nutrition teachers training and resources to help them teach the curriculum. A key aim is to upskill teachers in the preparation of game and supply schools directly with ingredients for cooking it. With training and support, we hope that they will use game confidently with your classes. This practical training matches current teaching requirements closely, so that you can develop your student’s knowledge and skills in how to buy, prepare, cook, present and taste game to a high level. Explore its nutritional benefits and uses in a modern balanced diet. Types, seasonality, nutritional benefits, cost, sustainability and environmental benefits. Pheasant facts – methods used to produce, availability and cost. Suitable recipes, how to use game for higher-level skills. Traditional and modern cuisine. 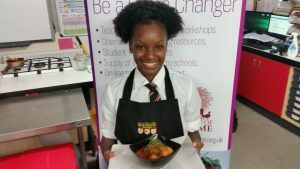 ” Great to have some hands-on practical experience of game recipes and given resources that are pupil friendly. Thank you so much. Simon Gray is an experienced teacher, head of department and was a Licence to Cook Lead practitioner. He’s worked outside teaching in Hospitality and Retail Catering Management. He’s also a Moderator and examiner and H&S consultant. He was part of the project team for School Food Champions programme leading a new project of designing and making healthier school lunches. He is able to offer advice and guidance on a wide range of food related activities, particularly in setting up and equipping food rooms, developing systems and procedures to operate food rooms in a safe and hygienic manner.